1 Start cooking the pasta according to package instructions with a dash of olive oil. 2 While the pasta is cooking, combine flour and pepper in a shallow bowl. Dip chicken in flour mixture, coating well. 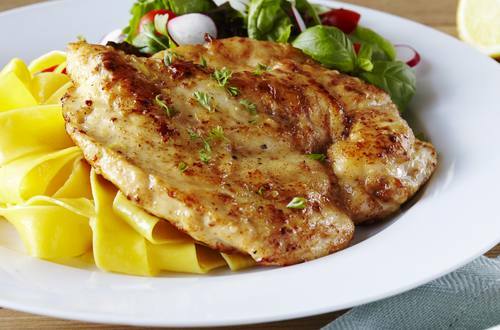 3 Melt 25g Flora Buttery in a large frying pan over medium heat and cook the chicken breasts, two at a time until chicken is thoroughly cooked, turning just once. Remove chicken to serving dish and keep warm. 4 Pour the chicken stock, lemon juice and zest into the same frying pan. Add the wine and bring to the boil over high heat, scraping brown bits from bottom of pan. Stir in remaining Flora Buttery until melted, add parsley, taste and adjust seasoning if required. Keep on very low heat. 5 Place pasta and chicken on a plate and pour the sauce over chicken. Garnish with lemon and more parsley if desired.